Let’s take a look at what you could win! Yet another week passes with no concert in sight, not even a smattering at Strathmore. Truly dead space, my friends. But take heart – even now a few brave souls reach their hands out across the void to offer you musical stuff. First up, the Baltimore Symphony Orchestra would like you to know that if you become a BSO Ambassador, you could win prizes. It’s actually less intensive than some other “ambassador” programs I’ve seen floating around – all you have to do is share news and information on your social media networks. They’ll periodically send you updates, you post it, done. The prize part has to do with how many times you post, how many people click to the BSO’s site, etc. etc. Worth checking out if you’re a BSO fan. Speaking of the BSO, Rusty Musicians is back! For those of you not aware of the program, the BSO offers amateur musicians – specifically targeting those who haven’t played in years – the opportunity to come rehearse with the BSO. Yes, the actual professional musicians – neat! I say “rehearse” and not “perform,” however, because as far as I can tell they’ve eliminated the actual performances of past years. All the same, it’s a great excuse to bust out your high school trumpet if it’s been gathering dust since commencement; vocalists may apply as well. There are two slots on November 13 only, so I’d act fast if you’re interested. Are you a fan of Garrison Keillor’s A Prairie Home Companion? (I know I am!) Do you sing? Well then why not audition to sing a duet with Keillor on the October 20 show? All genres accepted, and your odds are actually not so bad as all that – five or six finalists will be chosen to perform. Deadline to submit your audition is September 21, so get cracking! Last week I asked you to submit nominations for a Medal of Violar recipient. This week I award two — one reader-nominated and one me-nominated. Because I can. The reader-nominated winner is Daniel’s cat Gir, because when I suggested you nominated your pets I was mostly joking and he went there anyway. Well done, sir, well done. 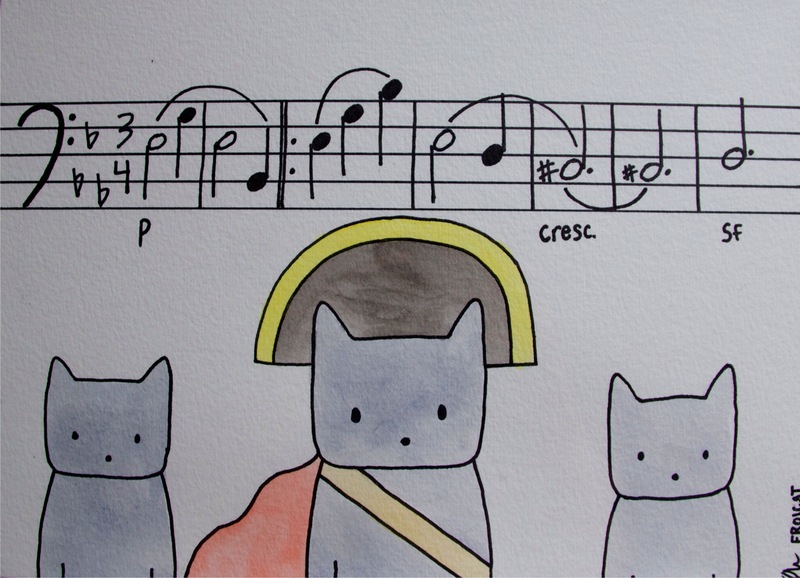 Says Daniel: “My cat, Gir, likes to sing along with Amanda and myself when certain songs are playing. For example, we can be playing Rockband 3 and she’ll walk onto our laps and meow and paw us in the face.” Congratulations, Gir! Maybe Daniel will engrave you a new tag to commemorate the occasion. The me-nominated winner is Mr. Stephen P. Brown, conductor extraordinaire who can always be counted on to chime in on discussion posts with a well-thought-out reply. He last popped up responding to my post about my dislike of children’s classical music programming, but he has made many excellent comments. Thanks for your readership and replies, Mr. Brown (Can Moo. Can You? Sorry, I couldn’t help myself)! Congratulations! Of sorts! Your names will be added to the wall later today. Thanks to all my readership — keep reading, submitting, and commenting, and you, too, may one day be the ashamed proud recipient of a Medal of Violar. And then you can buy yourself a mug! I like to encourage people to dream big, y’know. I can see just fine, thanks! I said there was no BSO concert this week. I didn’t say there was no BSO-related news. “O, Say Can You Sing” the national anthem with the Baltimore Symphony Orchestra? Capitalizing on American Idol’s appeal among local tweens and teens, the BSO announces its fourth annual singing competition, “O, Say Can You Sing?” Contestants will vie for the chance to sing the national anthem alongside the BSO in front of thousands at the BSO’s annual Star-Spangled Spectacular concerts held at Baltimore County’s Oregon Ridge Park, July 2-3. The competition is open to singers age 8 to 18. Sarah Jacobs from the 106.5 FM JoJo, Reagan and the Mix Morning Show will serve as celebrity judge alongside BSO staff members and local singing experts. Auditions will take place by appointment only on Thursday, June 2 from 3 p.m. to 6 p.m. at the Joseph Meyerhoff Symphony Hall. Each year, more than 60 contestants audition for the chance to sing the national anthem alongside the BSO. Last year, Baltimore School for the Arts student Scott AuCoin and former Miss Maryland Outstanding Teen Stephanie Meadowcroft snagged the coveted positions. These gifted youngsters not only performed with the BSO, but were also featured on several local TV and radio programs. Click here for registration and audition instructions. PLEASE NOTE: Audition times will be assigned on a “first come, first served” basis, by appointment only and parental permission (signed waiver form) will be required for all contestants under the age of 18. Contestants must be able to sing the “Star-Spangled Banner” in the key of B-flat major (F is starting note) or A-flat major (E-flat is starting note) along with an accompanist provided by the BSO. All entrants must be available for performances on both July 2 and 3, 2011. Registration deadline is 11:59 p.m. on Monday, May 30. I encourage all you student-types to go out for this. Heck, put your kid in there — no worries if he can’t sing; humiliation builds character, right? And if you do audition/have your kid/niece/cousin/whatever audition let me know! I want to a) get an interview and b) know who to root for. Oh, and regarding the Medial of Violar contest from yesterday, you have until Monday, April 25 to get your entries in. Until I helped put together the 2010-2011 BSO season web presence last year, I had no idea! Turns out Charlie Chaplin wrote, directed, starred in, and scored his 1925 film The Gold Rush. Well, the BSO is playing that music, and while they do that, they’re going to show the whole darn movie. Apparently it contains the famous “dance of the dinner rolls.” So I guess Beauty and the Beast didn’t do it first after all. Win Tickets to The Gold Rush! Fire up the webcam and get cracking! I know you all love an eclectic collection of unrelated bullet points. – I think, based on the fact that a lot of the profile photos show people with instruments, that some of you are friending me on Facebook. Which is totally cool and I’m down with being your internet buddy, except if I don’t know who you are or why you’re friending me I am generally disinclined to accept. In short, if you friend me, or you did friend me and I never reciprocated, send me a message explaining that you’re a fan of Ain’t Baroque and we shall carry on in peace and love. – You can still win a Symphonic Voyage cruise if you purchase a BSO subscription package! – The consensus among my friends is that if The Golden Girls was recast with composers, Bach would have to be Sophia. I don’t know, we’re weird. We also need help with the rest of the cast, if you have any ideas. I’d love to do a whole post on this; it’s the sort of thing I’d do, but I worry my long-suffering audience would finally rebel. – There is a fire drill exclusive to the summer camps that have moved into Strathmore going on right now (have I mentioned the summer camps? I have been inundated by an unusually large number of children and I disapprove of children in groups as they revert to their baser instincts in the herd). No one else is required to evacuate, but I’ve spent the last five minutes listening to a recorded message requesting me attention about a fire emergency on repeat. I am dangerously close to spontaneous combustion. Talk about your self-fulfilling prophecies. Anyway, did anyone go to a music/arts summer camp as a kid? What say you of the experience? – Updated to add: The BSO Academy needs more fans so that Facebook will recognize it! Become a fan now! NOW! I told you I’d get to it. The Well Played! 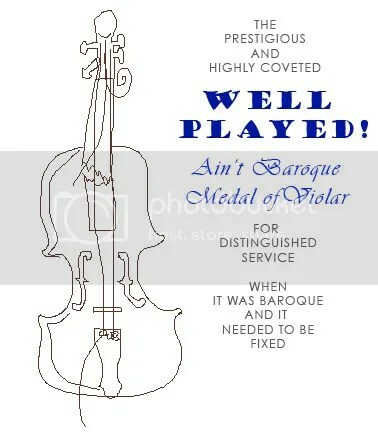 Ain’t Baroque Medal of Violar is a dubious honor. I mean it’s an honor I just made up. I mean it’s an honor! No need to qualify that. You can only get it by performing above and beyond the call of duty in the form of regular commentary and contribution and general awesomeness. Learn more and read the current list of honorees here. There are occasionally shortcuts, however. For example, you have until 9 am EST tomorrow (Wednesday) to enter the “define music major” contest. The author of the most clever excerpt automatically makes it onto the list. Think of prestige! Here are some things I think are nifty. If you buy a BSO subscription package, you could win a luxury cruise from Symphonic Voyages, which is exactly what it sounds like: a cruise with concerts. I was going to post a link to the BSO’s new Musician’s Concierge program, but as it turns out the form isn’t ready so I’ll have to put it off for a bit. Here’s a teaser: BSO musicians choose your season for you. This old Dave Barry article popped into my head the other day. Having finally thought to post on it, I can’t think how I ever didn’t think of it before. Read the whole article here and rejoice. Here is a joke just risque enough to be placed behind a cut. It is ever so slightly dirty, but it has not failed to elicit delighted laughter and a wild need to pass it along from a single person I’ve told it to. Q. What’s better than roses on your piano? Important! I’m extending the raffle deadline to Tuesday (tomorrow) at noon with recipients to be informed of their luck by 4 pm. I want to make sure everyone who filled out the survey gets the chance, so make sure you send me an email with the subject “Circus Maximus” and your name to bsointern@bsoatstrathmore.org. Each winner will get 2 tickets to the March 18 Strathmore performance. Enter now! This week’s concert is, as I already mentioned, entitled “Circus Maximus,” with performances at Strathmore on March 18 and at the Meyerhoff on March 19, 20, and 21. It includes Prokofiev’s Peter and the Wolf (see the below post) with narration by Scott Simon of NPR or, on the 21st, Rheda Becker. I would be just as clueless on John Corigliano‘s Circus Maximus if not for the helpful words of one of my Twitter followers: “It was more ‘event’ than music I would listen to over and over. Much like sports, better live than ‘on TV. '” Well, you heard the man. Better live than on TV. So you should buy tickets, and/or enter the raffle.